Step 1: Mix soda water, apple juice, mixed fruit juice, lime juice and honey in one jar. Step 2: Add cinnamon powder, mint leaves and ice cubes together. Step 3: Pour pomegranate and mixed chopped fruit juice in punch glass. Now pour honey fruit punch and serve it cold. This beverage recipe is a perfect party drink. Sweet blend of chopped variety fruits makes this easy recipe more delightful. The exquisite flavor of cinnamon powder surely knocks your socks off. 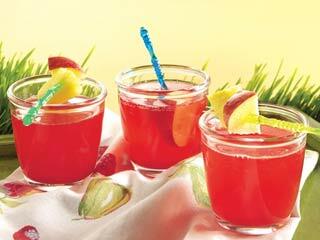 Enjoy this fruity punch on your weekend with your beloved ones.